Blow a kiss to the cuties of this Santa Rosa animal preserve (and snuggle closer to your own sweetheart, too). CUTTING OUT PAPER HEARTS? Placing Cupid-shaped cookies in strategic spots around the house? Breaking out the pink napkins and place mats, the ones that sit in the drawer all year long, only to emerge in February? There are numerous ways to delve into the darling delights and traditions of Valentine's Day, and many of them are centered around our homes, or, perhaps, the local romantic restaurant down the street. But if you're in love with an animal lover, and you're one, too, there is a route to truly reveling in the spirit of the day: By going to a spot that also loves and helps animals, all while explaining to we humans the facts and fascinating stories behind the beasties' complex inner and outer lives. 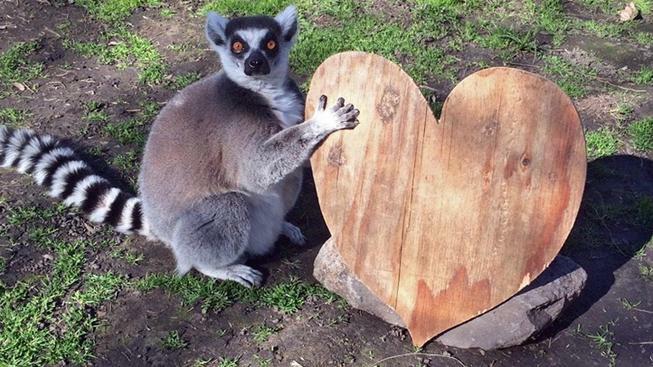 SAFARI WEST, in Santa Rosa, is one such exemplary place, and while it stays open, all year long, to give lemur aficionados and giraffe mavens a chance to see some of their favorite animals from a fairly close distance, Valentine's is something rather special. As it will be again in 2019, though keep in mind that Safari West will mark the holiday on the Saturday and Sunday immediately after Feb. 14, which falls on Thursday. The "adults only" to-do is $165 per person and includes "romantic decadent wild bites" and the chance to delve into the mating habits of the resident wildebeests and zebras. The "Safari Amour Tour" will take this tantalizing and eye-opening day a bit further. KEEP IN MIND... that while this is a Valentine's event, you won't want to get dressy. Comfortable clothing and sturdier, closed-toe shoes are the way to go. And, figure this: It's a daytime affair, which means you could be back home or at your hotel, all to change for a later-in-the-evening meal at some fancy restaurant. Surely you two will discuss all you learned at this birds & bees-y bash? Find out more, now, at Safari West.